← Da Silvano – Special Deal from BBE! So, I started this blog not only because of my affinity towards wine but because I wanted to use it as an opportunity to teach myself and learn the value and treasures of the ‘ins and outs’ of wine and the industry. I started reading ‘wine for dummies’ and realized, it’s just not all that fun “studying” wine without tasting and getting to know how to taste and match foods without an expert giving you a hands on experience…. 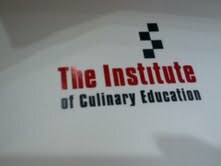 So, as an investment, I signed up for a Wine Essentials class at ICE (Institute of Culinary Education) in NYC. My first class was last night and I had the most amazing time listening about wine’s “accidental” creation and how regions were suddenly created as secrets for wine making were not shared and each “region” had to come up with their perfect balance themselves. We started slow and with background and the wine making process (Location, harvesting, cursing, fermentation, storage, bottling) then went into the fun stuff… TASTING! - Red wines fade as they get older hence the sediment at the bottom of your glass – wine is dropping/loosing it’s color so drink up! - Red wines get lighter as they age (Purple – Red – Brick – Brown) Don’t drink it if it’s Brown! 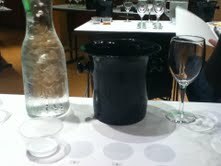 - White wines get darker as they age (Green – Yellow – Gold – Brown) Don’t drink it if it’s Brown! - Wines that taste ‘buttery’ have been fermented in an oak barrel, wines that taste ‘stoney’ are unoaked and most likely are stored in stainless steal! Wow! I feel like i attended the class after reading that!! !